If you cannot remember your password, you can reset it or create a new password. (1) Go to your section and go to the log in page, the way you normally would. Click on the “Forgotten your password?” link. 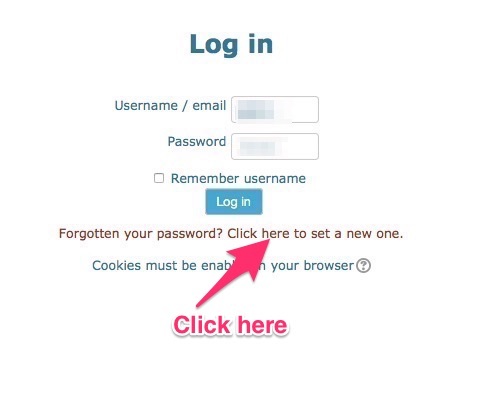 (2) On the page that now appears, enter EITHER your username OR your email address. Click the corresponding Search button. (3) Whoa! Do NOT click Continue. Instead, open your email program and look for the email we just sent you. It contains a link for you to click on. Why this step? To confirm that you are authorized to change your password. Look diligently for this email. It may need a few moments to arrive. It may end up in the Spam folder. Or in your email program’s Trash. In the worst case, your email administrator might mistake it for malware and block it. This is rare, but it can happen, and we have no control over this. Hotmail and Yahoo have been known to block our emails. Gmail has generally been reliable. If you do not receive the “access reset requested” email, contact us directly at our business email address (shown above the Continue button), and we will manually email you a temporary password. There may be a delay while we do this, so things work better when you can find the email and click on its link.